To throw pots you need a rotating disk. Since you need two hands to form the pot, you need helping hands to run the disk. Whether you need to use your feet. You can with a potter's wheel. In a sturdy frame is central erected a perfectly straight shaft. On top of the shaft is perfectly centered and straight, a disc of about 25 cm to throw a jar. Underneath is parallel above the ground on the same axis, a large and heavy wheel. It must be heavy to keep the movement going like a flywheel. With your feet you kick the wheel and keep it running. You can make it possibly heavier and balanced with clay and stone. On the frame you mount a seat so that your feet easily can reach the disk, but also have a solid support. Among the turntable in front of the seat you install a receptacle for water and clay. Of course, the shaft turns more easily in ball bearings. A potter's wheel was used already halfway through the fourth millennium BC. The potter's wheel is a Ptolemaic invention from the first century BC. Making a pot waterproof is possible by filling it after firing with raw milk and so leave it for a while. That would fill all the pores. You can pour boiling milk or buttermilk to leave in it. The casein clogges pores. Hygienic this would not be a problem if the pot is dried after use thoroughly to prevent mold. 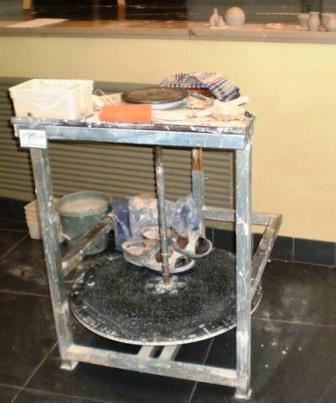 You can also polished with a smooth stone the inside and outside carefully before firing. Otherwise you have to go glaze. A new earthenware pot was also sealed by boiling the vase in linseed oil and then curing in an oven or by the fire.